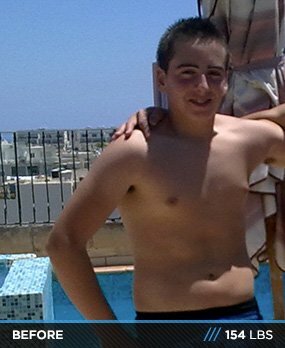 This Maltese teen completely revamped his physique in one year. His weight loss mission turned into a muscle building pilgrimage. See how he flipped the script and got ripped! I was always known as a chubby kid growing up and into my teens. I decided it was time for a change and started watching what I ate and exercising. I went from eating chocolate and playing computer games all day to eating healthy and jogging, but it didn't help me lose weight; I just didn't gain anymore. Everything changed when I started playing rugby and realized my fitness level wasn't acceptable. I avoided mirrors because I didn't like the way I looked. Due to my low self-esteem and fitness level, I started researching to improve my situation. My big change happened on May 24, 2011, when my cousin told me about Shaun T's "Insanity." I started the 60-day workout and quickly saw results. Within two weeks, my weight dropped from 154 to 149 pounds. The change improved my self-confidence and I continued on the program to improve my physique for summer. When summer arrived, I was down to 137 pounds. That's when my major transformation began and I stepped into the gym. Some of my friends worked out at the local gym and I decided to tag along. I had no clue what I was doing at first. Luckily, the gym staff was helpful and started me on full-body circuit training. I loved the feeling of working out and decided to take my gym work seriously. After conducting research, I drafted a five-day split to prove myself to everyone. After a long journey to change my body, I finally gained traction, but I didn't want to stop there; I wanted to take my body to another level and get ripped. I set myself on a strict training program. Sometimes I'd wake up, do 60 minutes of HIIT, jog to the gym in the afternoon for an intense workout session, and have rugby training in the evening. If I ever lost motivation, I looked at past photos that convinced me to never return to the past. 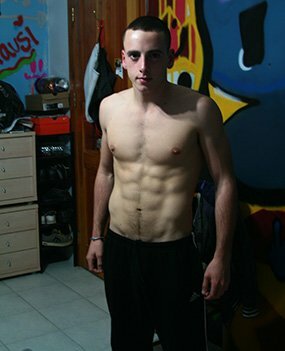 The articles on Bodybuilding.com kept me motivated about my goals. I wouldn't have been able to accomplish my goals without research. I searched throughout the bodybuilding websites and read every article and workout I could. The best motivation was through inspiration. When my friends saw my transformation, they wanted to join in my workouts. They asked me how and I showed them. The pump in my muscles after a great workout was extremely motivating also. I stuck with natural foods and tried to avoid sweets and chocolates as much as possible. If I had to eat food that went against my diet, I made sure to burn off the extra calories later. My routine is based on Jeff Seid's workout regimen, but I changed it a bit so it suited me. I warm up with a different leg exercise before each session (hack squats/squats) and work my abs four times per week right before I sleep. Following my diet plan was, and still is, the hardest challenge. I plan to continue improving my physique. I'm currently bulking, but I'm still too young to lift super heavy weights. Anything is possible. When faced with temptation, ask yourself, "Is this food going to improve me in any way?" Find a good routine, and stick to it. When it comes to cardio, I go with HIIT because you get a bigger return on your work. It's my main site to reference for any questions. Whenever I have any doubts, I just look up one of Bodybuilding.com's articles.